PHOENIX (Reuters) - In search of higher profits margins, Boeing Co is aiming to win more of the lucrative market for replacement parts and repair services, pitting the plane maker against major suppliers who view that growing $62 billion (51 billion pounds) a year market as their turf. Boeing told Reuters it has added 35,000 parts to stocks it positions around the world to serve airlines in the last year, after analysing its vast store of aircraft data to see where the parts will be needed. It has also cut prices on 24,000 parts to be more competitive, and it is expanding training and other services. Boeing is trying to capture more profit from spare parts made under licence by suppliers as well. To get there, it is producing some new parts in house to gain control over repairs, and sifting its databases to help airlines predict when planes will need service. The maker of such flagship jets as the 787 Dreamliner and top-selling 737 has been building its aftermarket business for years. But as demand for planes has slowed over the last 18 months, Boeing is now turning more aggressively to spare parts and services to help meet its own ambitious targets of doubling overall margins to the mid-teens by 2020. The main reason: a dollar of added aftermarket sales is more valuable than a dollar of new aircraft sales. Boeing's aftermarket sales have risen over the last three years and are outpacing the 4.5 percent growth of the broad aftermarket, Dennis Floyd, vice president of services strategy and business development at Boeing, told Reuters. "That means we're taking market share," he said. Boeing's effort is ratcheting up competition with many of its biggest suppliers, including Honeywell International Inc , United Technologies Corp and Rockwell Collins Inc , and repair operations such as Delta Air Lines Inc Technical Operations and Lufthansa Technik - which are all taking action to defend their lucrative franchises. Aftermarket sales typically offer margins of 20 percent or more - which makes expanding its presence in that market crucial to Boeing's effort to hit Chief Executive Dennis Muilenburg's overall profitability goal, analysts say. Boeing doesn't break out aftermarket revenue, and has not publicly discussed its aftermarket strategy in detail. Analysts estimate parts and services generate about $15 billion a year, or nearly 16 percent of Boeing's $96 billion in annual sales, split roughly evenly between its commercial aircraft and defence businesses. Industry experts say Boeing aims to more than triple aftermarket sales to as much as $50 billion over the next 10 years. Boeing declined to confirm a specific target, but the company's "leadership has set high aspirations," Floyd said. "We are investing heavily into these businesses." Boeing has logged its largest number of orders for its "GoldCare" aircraft maintenance service this year, and now counts 60 customers and 2,200 planes in the programme. "We're seeing the returns on these investments," Floyd said. Boeing partners with the likes of Honeywell Aerospace to do some repairs. But both are trying to increase their own sales of repairs and parts to airlines. That's why the two manufacturing heavyweights are "competimates," said Mike Beazley, vice president of aftermarket sales at Honeywell. "There's a segment of the market that will pay a premium to deal with one company" through Boeing GoldCare, he said. But many "would still like to have a direct relationship with the biggest suppliers." 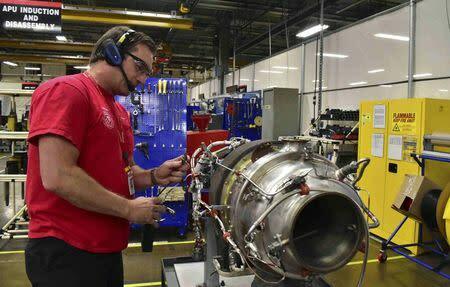 At Honeywell Aerospace's 360,000 square-foot aftermarket centre in Phoenix, the largest of its 40 repair stations around the globe, Andrew Newingham recently circled a small auxiliary aircraft engine on his workbench. As a robotic voice called out questions and Newingham answered, a computer logged details about what work the engine needed, reducing to minutes what was formerly an hours-long task involving paper checklists and typing on a computer. Honeywell aims to cut engine repair times to 20 calendar days or less, and offers upgrades and enhancements when engines come in for repairs. "What keeps us competitive and allows us to win new business is being able to offer speed," said Steve Foust, senior plant director. Repair organizations also are reacting as Boeing and its European rival Airbus Group SE try to grab business. Boeing partners with Lufthansa Technik [LUFT.UL] on some services. But it also undercuts Lufthansa on others. Low-cost, long-haul airline Norwegian Air Shuttle ASA , for example, considered several service groups, including Lufthansa Technik. In the end it picked GoldCare to maintain its 737 MAX and 787 jets, Asgeir Nyseth, chief operating officer of Norwegian Group, said in an interview. Boeing's service "was the cheapest one," he said, adding Norwegian benefited from the increased competition Boeing provided. Boeing and Airbus "have the advantage that they can combine an after-sale service package with the sale of the aircraft," said Lufthansa Technik's Frank Berweger, senior vice president of corporate sales for the Americas. In part to counter the aircraft makers, Lufthansa Technik plans to quadruple investment in research and product development to 200 million euros ($219.52 million) to 2018 from 2015, on top of increased spending on tooling and training to service new Boeing and Airbus jetliner types. Engine repairs make up nearly half of the service market, but those are largely beyond the reach of Boeing or Airbus. Engine makers such as General Electric Co and Pratt & Whitney locked up their aftermarket more than a decade ago. Kevin Michaels, president of consulting firm AeroDynamic Advisory, says Boeing will find it difficult to capture $50 billion in services revenue annually -- not to mention making a profit -- given the strength of some of the suppliers and specialist service companies. "Boeing has to be agile and cost competitive enough to win business from established players," Michaels said. "They need to be entrepreneurial. That's a challenge."